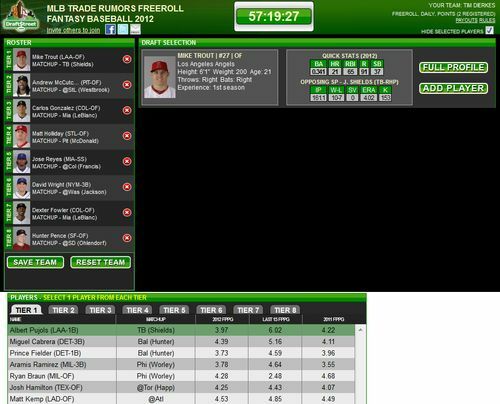 Pick one player from each of eight tiers and you've got a shot at part of the $400 prize pool in DraftStreet's latest MLBTR freeroll! You've got nothing to lose by signing up and making your picks, as this game has no entry fee. You'll be competing based on the stats your eight players accumulate in Friday's games. This is the last baseball freeroll of the year! Take five minutes to make your picks for Friday's games, and you've got a shot at the $400 prize pool! Please note that this post is a paid advertisement by DraftStreet. Give me the money already! Good luck winning, cuz i have the same team, thanks for the advise!! thank you man! but i really didn’t copy it, it was just a joke.